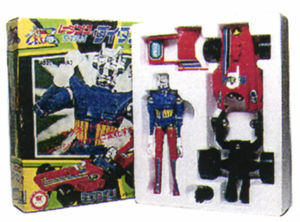 This version of Titan has a more stylized body than the first Titan series. 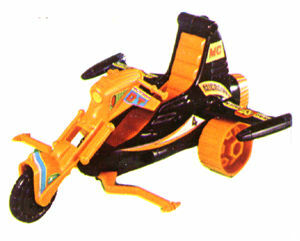 It too has a magno-powered body and you can remove its limbs and place the remainder in a race car which comes with it. 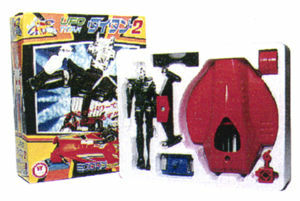 The figure is almost a full head taller than the basic Microman, hence the name Titan. 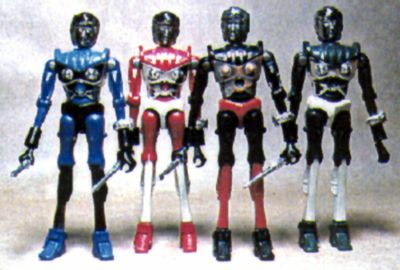 There is an unconfirmed variation for the Titans here and below: it is believed that some came with decals, and others had painted details. Called the Racing Titan 2. 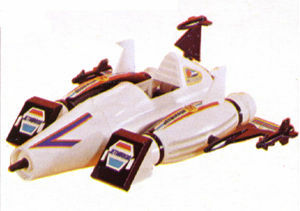 Identical in style to the Titans above, but the accessory was a UFO rather than a race car. Functions in the same way as the Titans above. 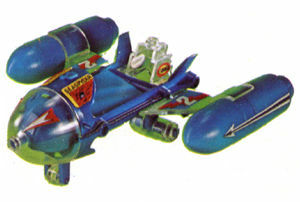 Another cool feature is that the UFO is able to shoot the Titan out the front in much the same way that a Shogun Warrior might shoot a missile. Commonly referred to as the UFO Titan II. Geag! 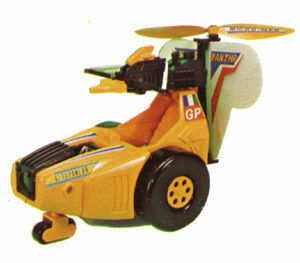 Geag was a character from an animated feature which ran for a period of time before this figure was released. Geag is everywhere - in bendies, in tin wind ups, in large die-casts, in huge plastic machinders, and in magnetic form. Several companies produced Geag products. He is one of the most licensed Japanese animation characters ever. 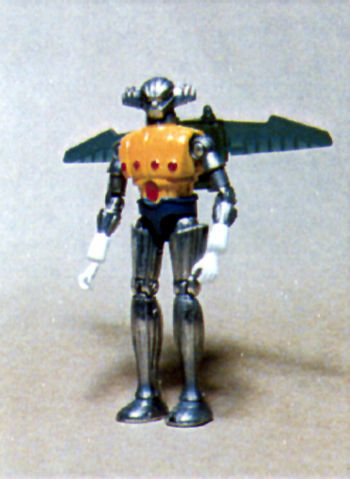 This figure is roughly the height of the average Microman, but made entirely of die-cast, save the wingset and hands, which are the standard Microman hands. 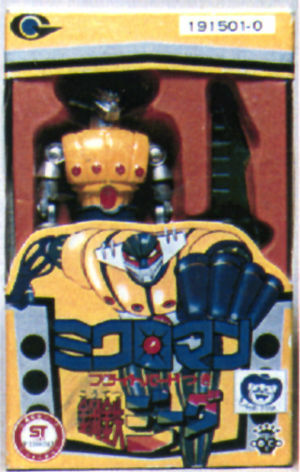 Look closely at this figure and you will see a body identical in shape to Baron Karza's. 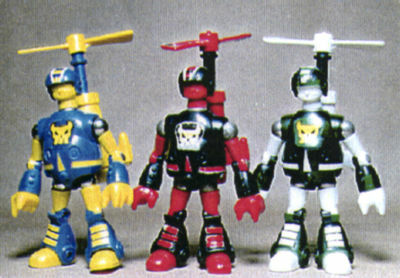 Geag was made into the first 7" magno-powered figure, and his body was later re-purposed for several Micronauts figures including Karza, King Atlas, etc. 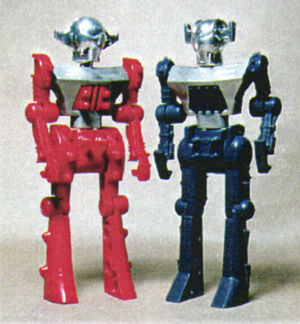 These two figures are the Acroyears which were later used to function as arms for Giant Acroyear. 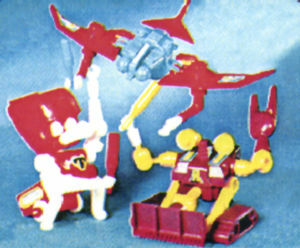 They were released in their own boxes (shown below) in 1976, and re-purposed as arms when Giant Acroyear was produced, though they may have actually been designed simultaneously. 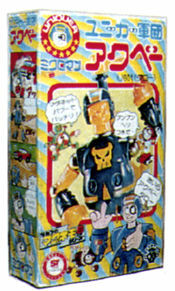 One of the easier Microman pieces to find, and sold for Y450 in 1976. Referred to by many (correctly or incorrectly) as the Acroyear Leader. This is a slightly taller Acroyear figure with wide wing-like appendages on its head. 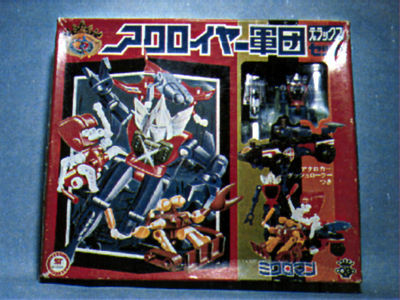 If you are looking for Acroyears, this is one of the more difficult to find in boxed condition. There is no window in the cardboard box. 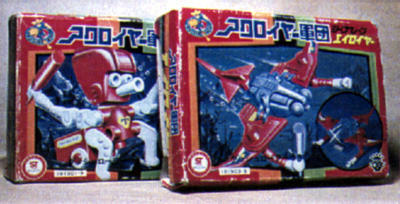 These are robots who serve the Acroyears. Kani-oyear translates to Crab-oyear, or Crab-Acroyear. 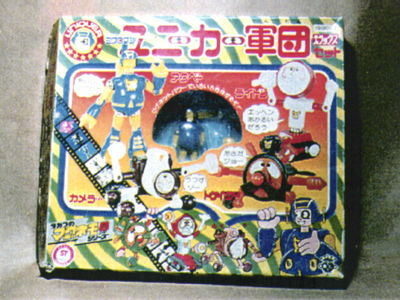 He is on the bottom right of the photo and features a bulldozer shovel. 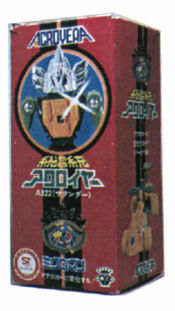 Ai-oyear translates to Ray-oyear, or Ray-Acroyear, and he features the standard white Microman hands. 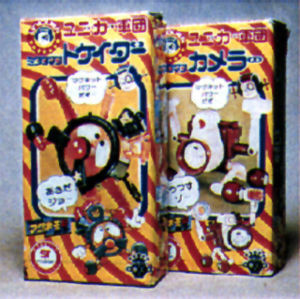 Tako-oyear, whose name translates to Octopus-oyear, or Octopus-Acroyear, has a motor and Microman hands. They are very hard to find. 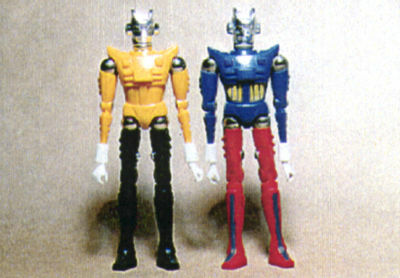 This is one of the many figure sets released by Takara as part of the original Microman line. 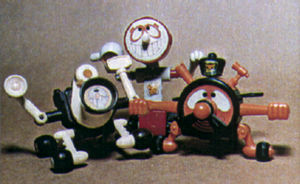 This set contains Kani-oyear, Ai-oyear, and Tako-oyear, plus a member of the A320 series, sometimes called (accurately or inaccurately) Acroyear Leader. 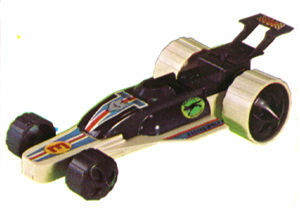 The set cost about Y1500 when it was released in 1976. 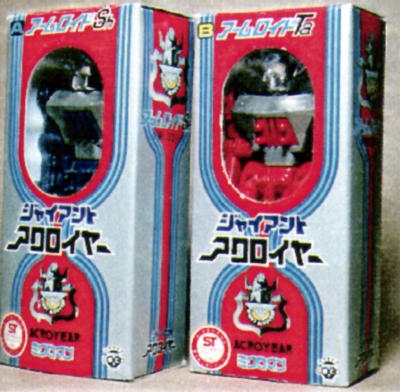 Because it contained some goofy characters, few were sold, and consequently they are very hard to find today. More Acroyear Uniquers, but this time with more color and detail. 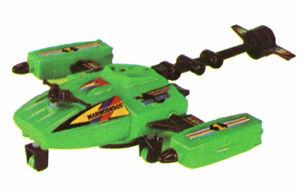 These guys have functioning propellers on their backs. 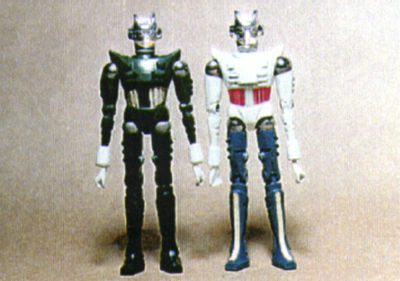 Despite their appearance in photos, they are actually somewhat smaller than the average Microman figure. 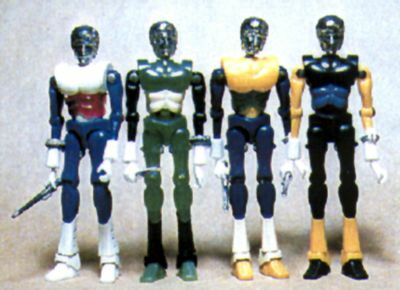 It's hard to believe that these guys are members of the same toy line as the Micronauts Acroyear I, but they are. They are nothing more than kooky, stylized versions of everyday objects, such as cameras. 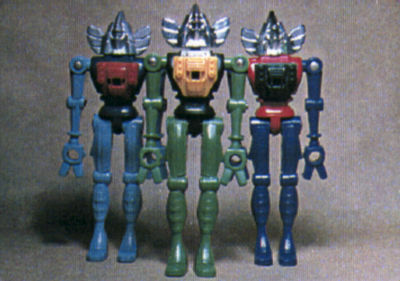 Another hard to find figure set, containing an Acroyear Uniquer (U601) and the three goofiest members of the Acroyear Uniquer line - Camera, Tokaida and Light-en. This was released in 1976 and cost Y1500. It is about as hard to find as the Acroyear Leader set and probably for the same reasons.